(AD) We have been kindly gifted the product, all thoughts and opinions are our own. Choosing the right car seat is one of the most intimidating processes for a parent. We put our trust in the versatile Joie i-Level (i-Size) when Norah was newborn as it was the perfect choice to fit onto our existing Joie Chrome frame and it had the unique sleepytime tilt’ (reclining to an 157° angle) feature. I am definably a parent that when they find a brand they trust, they stick with them. Suitable until baby reaches 13kg (18-24 months) Norah on the 98th percentile for growth both in height and weight, is rapidly growing out of her existing seat. She does love her biscuits. Meet the everystage™ FX Signature Group 0+/1/2/3 Car Seat. For parents wanting one car seat that does everything, that their children will not outgrow, the Joie everystage™ FX Signature is definitely for you. The ultimate transporter suitable for use from birth to approximately 12 years (0 – 36kg), this car seat can be fitted in vehicles with and without ISOFIX connectors. The epitome of flexibility with easy install options and growth every way for every stage, the seat starts rearward facing from birth and later converts to forward facing. For this everystage option style meets purpose in the perfect marriage of comfort and protection. I love the concept of not having to change from car seat to car seat every couple of years and this product fits the bill! Car seat sizing’s made easy. Confused by car seats? We clarify the latest UK car seat legislation to help you choose the right seat for your baby and child. Now car seat sizing is not an exact science as babies and children as we know do not come in one size fits all packages! Baby mode (Group 0+, rear facing, suitable from 0 – 18kg). Toddler mode (Group 1, forward facing, suitable from 9 – 18kg). Junior mode (Group 2 and 3, forward facing, suitable from 15-36kg). Which way your baby should face is one of the most hotly-debated questions among parents. Guidance advocates the option to keep your baby in the rearward facing position to the weight limit of the seat and/or until the age of two, and then beyond if possible, which is preferred in terms of safety advantages. Norah at 13 months faces forwards as she is over 13kg and she would cry until she made herself sick facing backwards. This is our choice but the everystage offers the extended option to be used rear facing up till 4 years. Checking information on the Gov website, with height-based seats they must be rear facing until your child is over 15 months old. This Joie model is an EU-approved weight-based child car seat (labelled ‘ECE R44’) so a Group 1 forwards facing option with harness is suitable for an older baby weighing 9kg to 18kg. 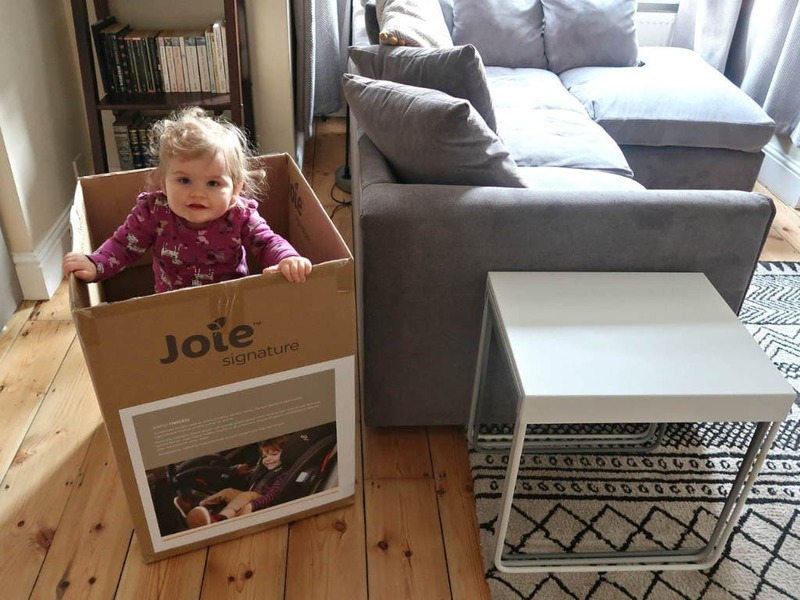 Pioneers of the multi stage car seat, Joie has certainly not disappointed with this model. Right from when I unboxed it, the everystage felt like a trustworthy product. It has a sturdy frame, the seat padding is luxurious, comfortable and the fabric durable. The ‘Ember’ colour looks stylish with faux leather touches and clean tailored lines, whilst still being practical. The dark fabric hides stains and wipes clean easily. Call me in a few years and I’ll let you know how well it lasted – but for now it looks great. The FX signature label exudes sophistication from all of time and for all of time. The everystage™ FX offers ISOFIX and belt installation. That said, it is important to note that this seat is installed ONLY with an in-vehicle seat belt when rearward facing (Group 0). The seatbelt is held in place by two firm lock clips to give an extra level of security. However, this does make it harder to give the seatbelt one last tighten once it’s installed. The car seat belt does pass across the doorway, meaning that you do need to lift your child over the seat belt strap to get them in and out of the car which could be awkward when they are sleeping. To me this would be one downside in the design. Helpful hint: Check beforehand on the Joie website on their fitting lists for the suitability of our car with this model. Whichever method you choose, it’s crucial to install your car seat correctly. But how do you decide which is the best option? ISOFIX provides a solid, permanent connection and is a fast and easy method to install which minimises the risk of incorrect installation. Belted options are flexible and as safe if installed properly. The most common mistakes are not pulling the belt tight enough, or leaving the belt twisted. Its useful to note, ISOFIX seats generally weigh more than seat belt-based seats and you do need to have a car with the ISO anchor points! There are two possible ways to install the everystage™ FX in Group 1 mode, by either using a belt or ISOFIX. Using the seat belt is very simple, which is good for parents wanting to move the seat regularly. It was simple to thread the belt through the forward-facing belt guides at the back of the car seat, click in the seat belt and lock the vehicle belt at the side of the car seat nearest the car door. We prefer to use the ISO connectors which can be used along with a top tether (simply switched to just the ISOSAFE arm connectors when used as a booster seat). The top tether strap increases stability and minimizes forward movement, keeping your child securely in place. Our previous seat was ISOFIX so we found it simple to insert the connectors, ensure indicators were green and the seat stable. The seat feels rock solid with either installation option and the well-marked, colour coded installation paths are super helpful. Robust and stylish, scoring high on its safety features and comfort the only downside is that the initial set up can take a while as you familiarise yourself with the settings. Joie has a helpful video to aid with this and I would recommend downloading the manual from the Joie website as it’s more easily searchable in pdf form. The 5-point harness is recommended to last until your child is around 18kg. In this mode, when the harness is no longer required, the straps simply hide away in handy compartments in the chassis, located behind the seat fabrics. The vehicle’s normal 3-point seat belt is used to secure the child, worn using a strap hook on the back of the headrest. Easy peasy. This is a very user-friendly car seat. The newborn insert (which includes: a head support, body support and wedge) can be removed when no longer required by 9 months. You then simply lift the Grow Together™ 10 position head rest and body support with an easy to access lever, to swap between stages, rolling 4 seats into 1. The straps of the five-point harness adjust automatically, which is a huge plus, as well as the AutoAdjust™ side wings of the seat extending outwards as the height of the headrest increases. Enjoy clever additions such as a cup holder for older children to have their drink to hand – perfect for longer journeys. Does a multi stage car seat lose out on safety or quality? Can one seat actually cater for the safety needs of a new born baby to a twelve-year-old? The key features I look for in a car seat are safety and protection. With the Joie everystage FX the Guard Surround Safety™ panels provide extra side protection for the head, body and hips which fold into frame when not in use. A steel reinforced shell also increases the durability and strength of the seat. It has a lot of plush padding and inserts whose textured and quilted fabrics are soft and comfortable to the touch. The shoulder pads have an anti-slip coating and contrary to a couple of negative reviews we read I found it very easily to tighten the 5-point harness. There are two recline settings in rearward facing mode, and four when forward facing which offers versatility and comfort. With the headrest it supported my daughter’s head very nicely. It fit quite close but as you raise the headrest it automatically widens which means it won’t be too snug as she grows. Down to the nitty gritty. As with any non-portable car seat, it is not travel system compatible and stays in your vehicle. With a newborn, you will then need to transfer them from car seat to pushchair and you then would need to ensure you purchased a pram with lie flat or carrycot option. Because of the sedentary design this is a weighty car seat so if you were thinking of transferring it often between cars it may be awkward. That said its selling point is to meet the safety needs of a newborn to twelve-year-old so if you opened the box and lifted up a lightweight seat you would be nervous! The main thing I would change about the seat would be for it to have ISOFIX installation both rearward and forward facing for the earlier stages. In a smaller car its size may be cumbersome but in terms of value for money, this one-off purchase is a great long term investment for any family!